This week Bean Ninjas finalised a deal to acquire the client book of US based bookkeeping firm Prescribed Financial Management. Part of this deal involves Prescribed founder Wayne Richard joining Bean Ninjas as Global Director of Operations and as an equity partner. So how did a 3 year old bookkeeping firm based in Australia come to acquire a US firm? 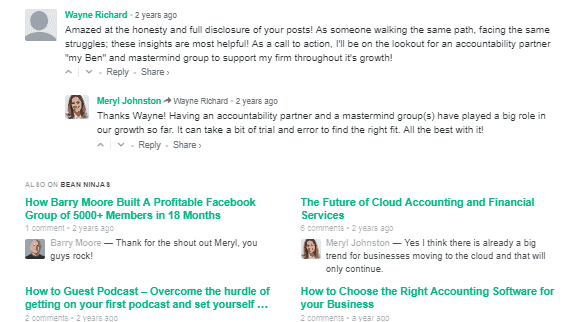 It all started when Wayne Richard heard me (Meryl Johnston, Bean Ninjas founder) on a podcast interview and was intrigued by my different approach to running a bookkeeping firm. Wayne then found inspiration in the Bean Ninjas blog and reached out to me by commenting on one of our articles. A few months later, in October 2016, Wayne joined Bean Ninjas as a part-time contractor while also building up his own US based bookkeeping firm. 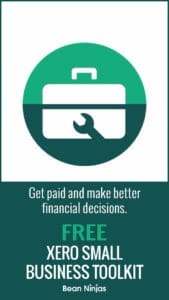 “At this point, I had spent just over a year, alone in a small corner of my master bedroom, having invested tremendous time, most of my financial resources and all my energy building my own cloud bookkeeping agency. At this point, in my development as an entrepreneur, I had a desire to grow and faith that I held the qualities to do so but also understood that I could not get there without the help and support from a team, an accountability partner, or mastermind of other high-achieving like-minded accountants. After leaving corporate behind, Wayne had read about something called the “Irresistible Workplace,” compiled of five components, and then actively sought to create that environment for himself. He eventually found all of these components with Bean Ninjas. The way Wayne heard about Bean Ninjas and eventually joined the team is a great example of how being authentic can help attract like minded people. I took a risk in hiring Wayne knowing that he was also building his own bookkeeping business that could compete directly with Bean Ninjas. Wayne took a risk working at contracting rates for Bean Ninjas instead of the rates he could earn in his own business. All with the goal … but not the guarantee of one day becoming a partner in Bean Ninjas. The relationship was built on a foundation of shared values and during a period of almost 2 years of working together we’ve built up a mutual respect and trust. Having a clear vision about what we want to achieve at Bean Ninjas also helped to bring clarity to our decisions about whether the partnership opportunity was a good fit for us both. “In my first Skype video chat with Meryl, it was unbelievable how aligned we were regarding a vision for what an emerging bookkeeping firm would look like! We both clearly understood and were passionate about innovating in the accounting industry and providing our customers with a new approach on managing their business financials. Having had the benefit of finding Bean Ninjas early in their growth, I’ve been fortunate to have had the opportunity to participate in developing many of the core foundations of our company and culture. So how did Wayne go from commenting on a blog post to becoming a business partner in less than 2 years? 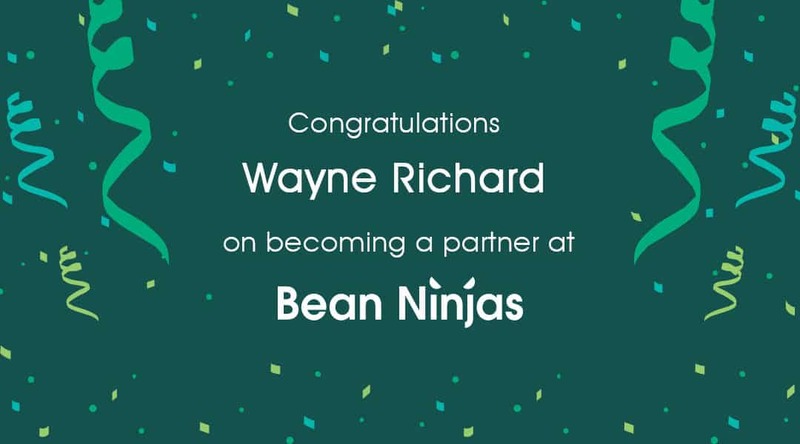 I think this partly comes back to our initial agreement; Wayne started at Bean Ninjas with the understanding there would eventually be partnership opportunities. My own attitude to equity also plays a role, as do the great results Wayne achieved for Bean Ninjas and his own business during 2017 and 2018. I acquired 50% of Bean Ninjas from my co-founder Ben in 2016, which increased my holding to 100%. In 2017 I raised capital and issued equity to a passive investor, Simon Pilkington. Since then I’ve been asked a number of times why I was willing to give up equity in Bean Ninjas. I think this comes back to the concept of “it being better to own a smaller piece of a larger pie than a larger piece of a smaller pie”. Having investment in Bean Ninjas has facilitated rapid growth, but has also created a wonderful mentor relationship with Simon, who is an experienced and successful businessman. Related reading: When 2 Founders become 1: Lessons Learned About Business Partnerships and Bean Ninjas raises capital to fund rapid growth! In the spirit of transparency we thought it might be interesting for other business owners to see how we structured the deal with Wayne..
Let’s start by looking at the reasons Wayne and I both felt we could benefit from this. An equity stake (with a share of profit) in a fast growing global bookkeeping firm which has an established team and systems and a brand presence. Leveraging the Bean Ninjas brand also gives Wayne a way to fast track his own personal brand and network. Wayne refers to the team at Bean Ninjas as the team he would have built. By joining Bean Ninjas he doesn’t need to build this team from the ground up. He can also focus on his strengths in building teams and customer relationships and have other team members take care of other areas of the business. “The benefit of a team is that often we limit ourselves as entrepreneurs or individual performers to what we are capable of accomplishing. A team, an accountability partner or a mastermind can unlock those limiters and open you to new possibilities. To bring on a highly motivated accountant with shared values and who has an entrepreneurial spirit. We’re expecting Wayne to drive the growth of our global business particularly in the northern hemisphere. One of the first areas we needed to agree on was to separate our wages with ownership of the business. I was already familiar with this concept having put a similar arrangement in place during negotiations with our investor Simon. Ownership of the business brings rights to a share of profits and proceeds from a business sale. Wayne’s salary is structured as a base salary plus a bonus that is tied to KPIs which align with our overall business strategy. Another step in the negotiations was to value both Bean Ninjas and Prescribed Financial Management. We’ve made a significant investment in Bean Ninja systems and team development over the last few years, so both Wayne and I both agreed that Bean Ninjas would be valued using a higher multiple. I’m flying to the US in a few days to join with Wayne in officially opening our US office. Wayne’s already had a huge impact working part-time at Bean Ninjas, so we can’t wait to see the progress once he’s working full-time in the role of Global Director of Operations.